괘불이란 절에서 큰 법회나 의식을 행하기 위해 법당 앞뜰에 걸어놓고 예배를 드리는 대형 불교그림을 말하는데 천은사괘불탱은 석가의 모습이 단독으로 그려진 괘불이다. 크기는 길이 894㎝, 폭 567㎝로, 거대한 화면에 꽉 차게 정면을 향하여 서 있는 석가의 모습을 그렸다. 조선 현종 14년(1673)에 경심·지감·능성 등의 화원이 그린 이 괘불은 단독상으로 괴체적인 형태, 항토색이 강한 독특한 채색, 필선, 문양 등에서 17세기 후반의 새로운 경향을 보여주는 중요한 자료로 평가된다. This type of large-sized painting used to be hung in the front courtyard of a temple hall at an open-air sermon session or ritual. 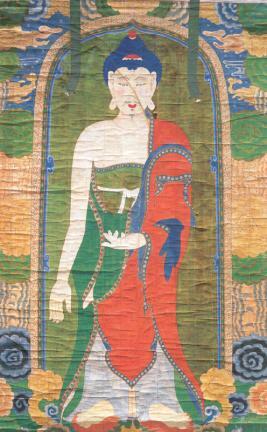 This hanging painting contains the image of Shakyamuni Buddha standing alone and measures 894㎝ (L) by 567㎝ (W). The piece was made by painters Gyeongsim, Jigam, Neungseong, etc., in 1673 (the 14th year of King Hyeonjong’s reign). It displays a new trend of painting of the later 17th Century, with the grotesque appearance and unique colors, brush strokes, and patterns displaying a unique local atmosphere.